This company built bodies for Datsun before making its own design, called the Flying Feather. 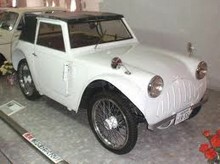 This was an extremely lightweight small 2-seater with a roll-up roof and tall, motorcycle-type wheels. In a transverse-sprung chasssis, the V-twin air-cooled engine of 350cc capacity and 12.5bhp was mounted in the tail driving through a 3-speed transmission, and a top speed of 40mph was claimed. A pre-production batch of cars was produced but Suminoe decided to pursue other activities.